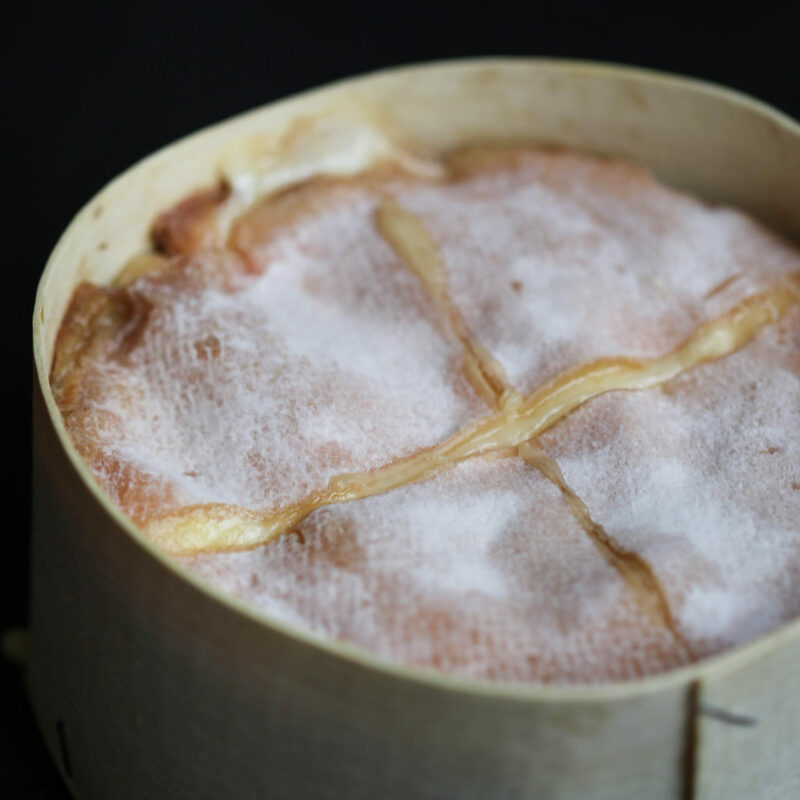 Vacherin Mont D’Or hot out the oven! If you’re as obsessed with cheese and cheesemaking as we are, you’ve no doubt come to love cheeses made from summer milk. 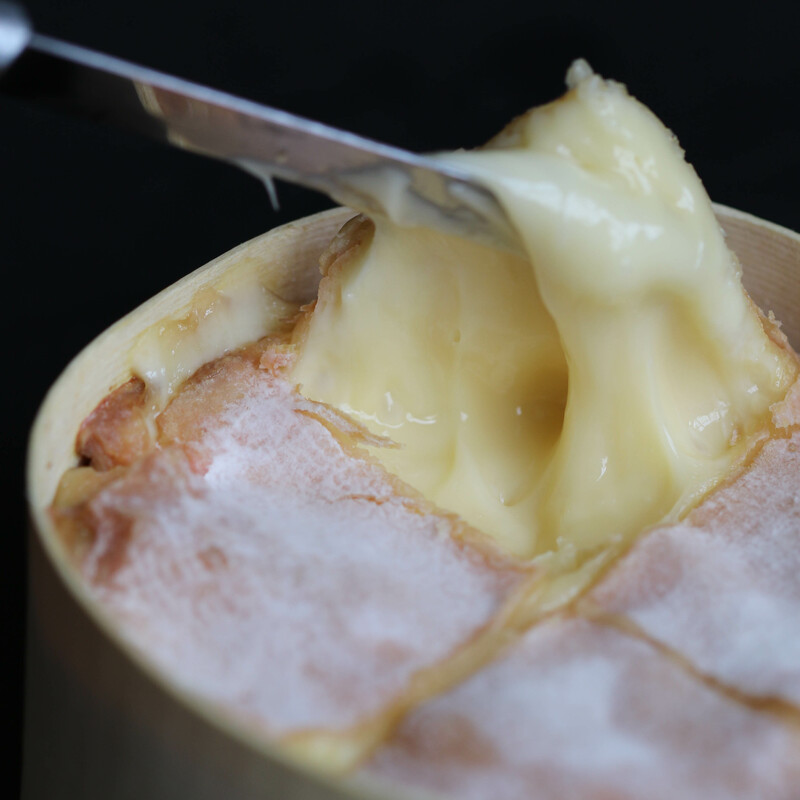 Especially prized are those Alpine heavyweights like Gruyere and Comte, whose traditions mandate that cows are led up to high altitudes for the summer months, where they graze on wild grasses and flowers only briefly uncovered by snowmelt. The result of this forage is milk rich in unique flavor compounds, which translates to especially deep, complex, fruity and nutty cheeses. But what about the other nine months of the year? What to do with Bessie’s milk when she’s returned from her mountaintop culinary adventure, to a comparatively bland regimen of hay and grain? Autumn and winter milk have an attraction all their own; a density of solid fat and protein that give us cheeses of unrivaled richness. The cheesemakers on both the French and Swiss sides of the majestic Mont d’Or love this milk so much, in fact, that they waste no time whatsoever crafting it into a one-of-a-kind soft, gooey delicacy as soon as late August hits and the cows come home. I’m referring, of course, to Vacherin Mont d’Or. So soft and fragile that it must be bound in fir bark and packed in a wooden box to prevent it running away, Vacherin Mont d’Or makes a formidable first impression with a characteristic pungent smell and a thick, wavy, pink orange rind that, when pulled back, reveals golden paste with the texture of thick pudding. Only available October to December, and notoriously hard to come by outside of its home region, it is the rarest and most delicate of delicacies – usually catalogued among the world’s very best cheeses. While this reputation is well deserved, it often has the unintended consequence of driving connoiseurs and first-time customers alike to timid trepidation. 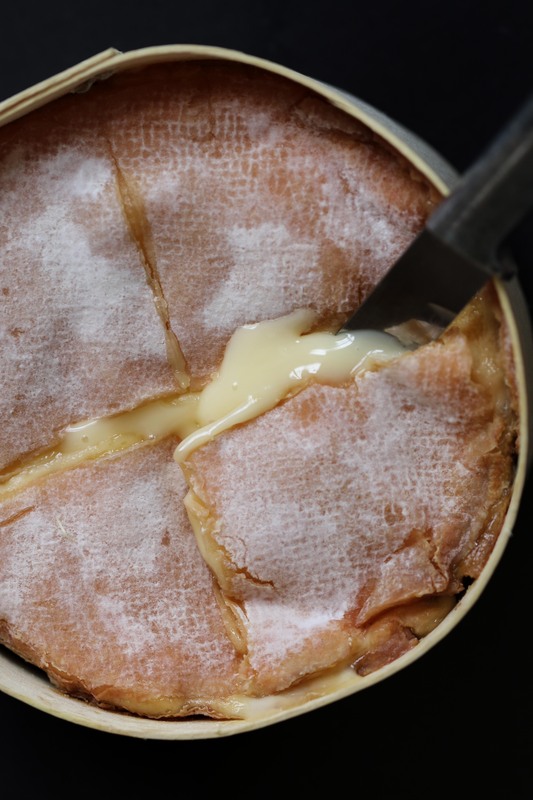 And this is a shame, because as dainty and delicate as Vacherin may appear, it is a mighty burst of flavor and texture that is best dived into head first. 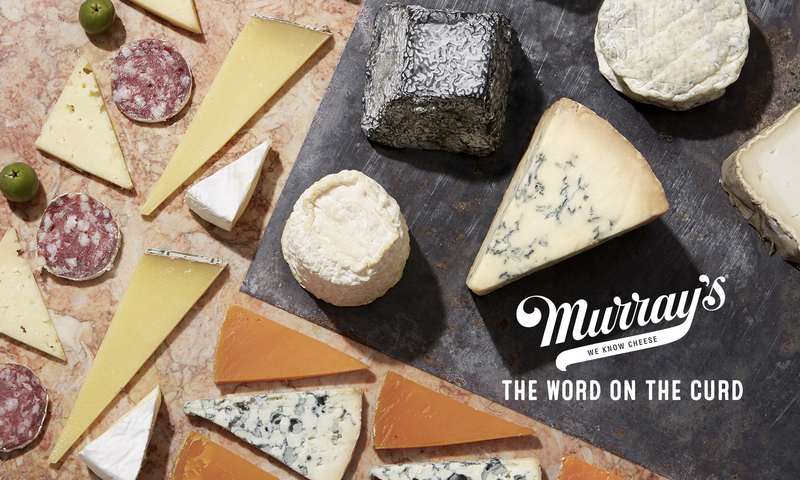 To remove some of the intimidation factor, the dedicated crew here at Murrays worked a little overtime this weekend; we took a wheel home, assembled food and beverage pairings of all shapes, sizes, colors, and flavors, and concocted a definitive three course progression for you, so you too can go three rounds with the undisputed featherweight champion of the cheese world. Alas, work life balance eludes us again! This three course cheese progression uses one wheel of Vacherin Mont d’Ord’Or and will feed 2-4 funky friends. With a pie server, make a deep X through the rind of your Vacherin, dividing the wheel into four equal portions. Remove the top and bottom wedge (the North and South wedge; the 12 o clock and 6 o clock wedge) from the wooden round and place them aside in separate dishes (a small bowl works best, because remember, this bad boy runs at room temperature). Spoiler alert! We’re about to eat one of those two set aside wedges, but first we need to do a little prep for round 2, which is adapted from an old standby “Baked Vacherin” recipe. Finely chop up a clove of garlic, and a sprig or two each of sage, rosemary, and thyme, and sprinkle them on top of the Vacherin still in its wooden box, as well as into the voids left by your two removed wedges. Cover with foil, and set aside at room temperature for about 30 minutes, during which time the paste will run together to fill in the voids. While you’re waiting, come back to the present! Grab one of your removed-and-set-aside wedges, and spoon it liberally onto whole wheat bread, crackers, apple and pear slices, and berries. This is Vacherin Mont d’Or in its state of nature, as God intended it. He evidently also liked unoaked Chardonnay because it makes an A++ pairing to your Vacherin Mont d’Hors d’Oevres. How ya doing there, champ? Ready for another round? We know you can do it. You got this! Preheat your oven to 425 Fahrenheit. When it’s good and toasty, remove the foil from your wooden box of herbed Vacherin, which by now will have run together in a nice goopy mess that fills out the container. Plop the whole thing, box and all, into your oven for ten minutes. While it’s cooking, slice a Creminelli Wild Boar Salami or two on a bias, and serve with more bread, as well as whatever roasted veggies you tend to enjoy (we highly recommend Brussels sprouts, red potatoes, and shallots). At the moment of truth, remove your Vacherin from the oven, and dip your salami and veggies into it like it’s fondue. Fon-don’t-mind-if-I-due, amirite? We know you killed that Chardonnay in round one, so enjoy this with a bottle of Beaujolais Nouveau. Look, we love working with the finest of foods, but it’s hard to be so damn fancy all the time. Sometimes, you’ve just gotta keep it simple. Dark chocolate squares (we loved it with Pralus Chocolatier Equateur Tablette). Stack, serve, eat, repeat! Pair this with a chilled red Chileno. Sing campfire songs, tell spooky stories, pass out…and dream dreams of baby dairy cows frolicking on verdant mountain pasture. Do you eat the rind too? You certainly can, Gil! There’s tons of flavor in there! Previous PostPrevious Cider and Cheese, Please!